The Investigation Bureau is probing 41 cases of destruction to public land across Taiwan. Investigators say they've caught unscrupulous business interests illegally excavating state-owned land and even dumping toxic waste. A preliminary survey shows that these illicit activities have destroyed over 440,000 square meters of public land. This temple in New Taipei’s Shiding District looks ordinary enough. A closer inspection reveals that it was built here illegally on state-owned land. 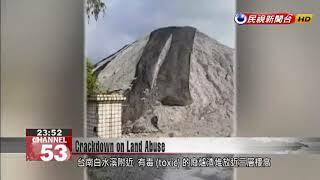 Near the Baishuei River in Tainan, toxic slag is piled nearly three stories high, severely polluting the waterway. Across Taiwan, cases concerning the unlawful use of public land or mountainsides are too numerous to count. But the Investigation Bureau is trying. Yesterday a probe carried out by nearly 200 investigators uncovered 41 instances of unlawful land use spanning more than 440,000 square meters. What many people don’t know is that operators of illegal campsites or illegal recreational farms are actually running their ventures at geologically sensitive areas that are prone to landslides. With illegal development at these sensitive areas, there is a landslide hazard. Ultimately, it is the public’s safety that is endangered. Officials stress that these rampant land abuses threaten public safety. The Investigation Bureau is hoping its crackdown on offenses sends a clear message that can help stem the tide.